Right across from The Yard House, next to It's Sugar by the West Passage. Your team must enter Cyberdyne System’s Headquarters. Several objectives must be completed to save mankind from the machines. This game includes lasers, strobe, smell and fog effects. Terminator 2: Judgment Day, T2, THE TERMINATOR, ENDOSKELETON, and any depiction of Endoskeleton are trademarks of Studiocanal S.A.S. All Rights Reserved. © 2018 Studiocanal S.A.S. ® All Rights Reserved. 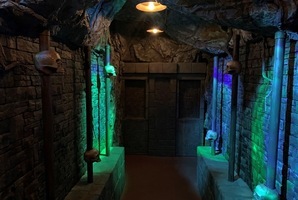 Reviews of escape game "Terminator 2 Escape"